The emu is the largest bird native to Australia. It is the second-largest bird in the world (still in existence) by height, other than the ostrich. These soft-feathered, brown, flightless birds reach up 6.2 feet in height. They have long thin necks and legs. 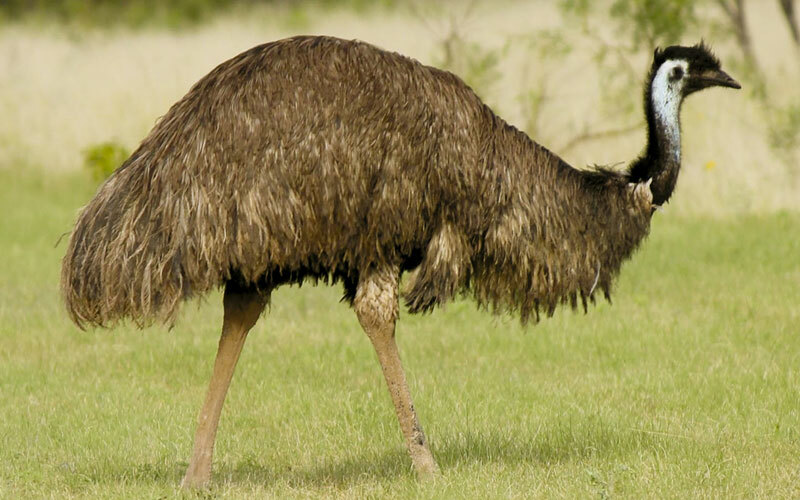 Emus can travel great distances at a fast, economical trot and if necessary can sprint at 31 mph. Their long legs allow them to take strides of up to 9.02 feet. They may travel long distances to find food and feed on a variety of plants and insects but have been known to go for weeks without food. Emus ingest stones, glass shards and bits of metal to grind food in the digestive system. They drink infrequently, but take in a lot of fluids when the opportunity arises. They are curious birds known for following and watching other animals and humans. Emus use their strongly-clawed feet as a defence mechanism. Their legs are the strongest of any animal and will even allow them to rip metal wire fences. They have very good eyesight and hearing which allows them to detect predators easily.